Iris Cottage is on a small complex of town-houses forming a quadrangle containing well landscaped communal gardens and large pool. The property is set back to one corner of the quadrangle and very well landscaped to provide a secluded rear patio area for dining and sun bathing. The property is centrally located for easy access to the seafront and harbour of Kato Paphos, as well as Bar Street and a large selection of restaurants. The old town of Paphos set on the hill is also easy to access. Upstairs bathroom with bath and overhead shower facility, plus toilet. Downstairs is a separate toilet with washbasin. Full air- conditioning; with one unit in lounge/ dining area; one unit in the master bedroom and one unit in second bedroom; also large modern ceiling fans in master bedroom and second bedroom. Wintertime stay includes portable electric oil filled radiators to the two bedrooms and a portable calor gas heater to the lounge/ diner area. Please liaise with property manager for use. Fitted washing machine available for guests use. Off-road parking at front and rear of property on the complex. Wi-Fi access in house via Cyta available to all guests without any additional charges. Bathroom towels provided; sun towels not provided. Open plan living which includes dining table and six chairs. 2 double sofas. A 32" flat screen TV with UK internet tv and a DVD player. General mix of dishes and utensils for light cooking needs and for up to 4 people eating. Includes: electric cooker, gas hob, large fridge freezer, washing machine, microwave and toaster. Round wood dining table, and chairs with seating for 6 people. UK TV and wide range of channels available via internet. Small collection of paperbacks plus travel guides and maps. Well planted & maintained small rear garden area, providing complete enclosure & privacy from complex; includes rear gate access to complex. To side & front of property Hibiscus hedge & bougainvillea. South facing garden terrace with outdoor lighting; table and 4 chairs for outdoor eating; complex includes large terrace beside pool and well planted mature communal garden. There are 3 very good golf courses close to Paphos all within 20 minutes drive from the house. Large, 20m length swimming pool,also includes a shallow section. NB: As pool is not supervised (being on a private complex) request parents at all times supervise children using the pool. A lovely well equipped home in a quiet residential area of Paphos. We loved sitting in the private garden or by the pool. Easy walk to local shops and into Paphos Town or Kato Paphos. We had a very enjoyable 4 week stay in Iris Cottage. This two bedroom townhouse was clean and well-equipped. The position of the villa, not being on poolside and the private garden with a gate were perfect as we had two young children with us. We did however enjoy the pool every day which was a lovely size and well maintained. The location of the villa was very central for our needs within good proximity to all amenities and Pambis Diner just a short walk away was great. The owner John was very friendly and quick to respond to emails and queries. The house was pristinely clean when we arrived. It has everything you need kitchen wise, a lovely private terrace with furniture and a comfortable lounge with satellite TV. Linen was good quality and there were beach towels and sun beds for use around the pool. The pool again immaculately clean and the terrace areas were quiet and spacious. the only problem was too much noise from nearby building site, plus the fact that for two consecutive days there was a lot of noise from front & back of property with people using petrol hedge trimmers & chainsaws cutting hedges & trees very close to cottage. This should be done when property is empty so I was not happy about this. The property is located in a complex of 40 townhouses that form a quadrangle around a large communal pool and gardens. It was chosen by me in 2007 for its very quiet residential location, its attractive and secluded rear garden, the well planted and maintained communal gardens, and reasonable walking distance to the harbour and amenities. I suggest the noise was short lived and to some extent beyond my control, whilst I have never had any adverse comments about noise in 10 years of holiday lets. However, it is accepted that routine garden maintenance works will cause temporary levels of disturbance both in my garden, from adjoining gardens and the complex. My magnificent Hibiscus hedge is cut once a month together with tidying the feature rear garden. On the day my gardener arrived, he asked the guest if he could cut the hedge, which the guest willing agreed to, only to be asked to stop when the work was nearly complete, and which the gardener duly obliged. This work is often done during holiday lets because of the number of lets received and the lack of lead-in time available to organise such visits to coincide with the change over, which guests accept. I should point out that this holiday let was agreed at short notice (19 days). Other work beyond the property, including tree maintenance, could reasonably be expected in April, given the tourist season has just commenced and plants are growing. I understand from a conversation the gardener had with the guest, that the neighbour's hedge had been cut the day before. Whilst the building works refereed to, are over 100 meters from the complex, comprising the construction of an apartment block on an infill site, and do not directly overlooking the complex. Finally, I should point out from the guest's observations that the actual property experience was fine. This speaks for itself and justifies the 5 star rating that other guests regularly give for the property and holiday letting experience, as I would always aim to deliver upon and justifiably feel proud of. Exactly as it says on the tin ! Aidan, Marie and their son, were excellent guests and most welcome to stay. I would like to thank you for looking after the house so well. I am pleased you enjoyed your 11 day stay in August at Iris Cottages, and that it met your expectations, whilst enjoying the large pool on the complex and my small but private and well screened garden, and pleased you appreciated the fridge essentials that Andy left for your arrival. I am also very glad that you enjoyed doing alot of site-seeing. I am pleased you were able to visit the beautiful Troodos Mountains and swim at the Blue Lagoon, whilst also experiencing some of Cyprus's rich heritage, such as Kykkos Monastery, and the mosaics in Paphos. Although you had to travel some way by flying into Larnaca, you had the benefit of the hire car and the opportunity of seeing some lovely places well beyond the Paphos area. There is so much to do in Cyprus that it is sometimes difficult to choose. But I am impressed. I am also impressed by your separate response to me in regard to car-hire. In particular, your professional way in which you engaged the car hire. 'You can never be too careful' is an appropriate adage in today's car hire business. I have given 5 out of 5 star on the Ownersdirect feedback for my guests. It remains for me to say that you are most welcome to stay again anytime. Arrived for our stay at Iris cottages..on the 8/07/2017. Picked up from the airport and just a 20 minute taxi ride to the house which was well equipped for our stay and had the essentials (tea,coffee etc) in the cupboards. There is a farm shop nearby which stocked everything we needed during our stay. Andy next door ( property manager) was always to hand if we needed any help....even printed off our boarding passes to return home as we completely forgot about them !!!! Would definitely recommend Iris cottage and will be returning again. Thank you for our lovely stay. A 20 minute walk from Iris Cottage will take you to the local beaches in Kato Paphos. However if you want a trip to Coral Bay there is a very good bus service which will drop you right there! 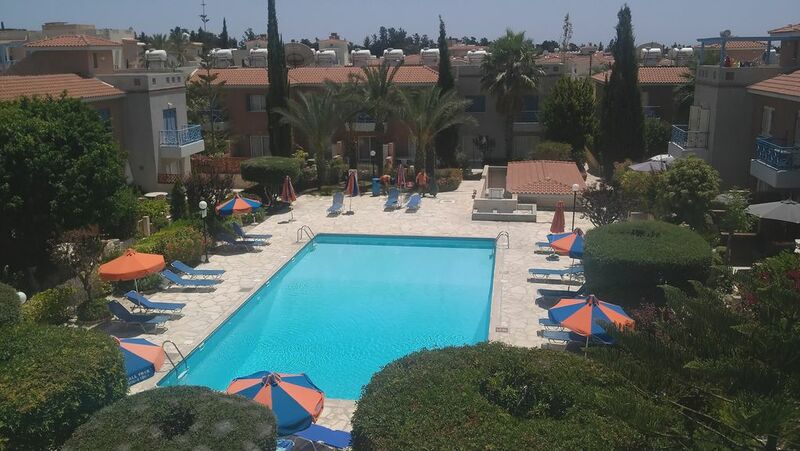 Paphos airport is 15 minutes drive from Iris Cottages. You can hire a car to explore a little, however the position of the house is such that many local amenities are within walking distance. Pambis Diner is just 5 minutes walk away. Bar Street is 20 minutes walk away. 'The Garden of Eden' or Russian Market, with local fresh produce is 5 minutes by car. There is an information booklet for all our guests in the house. The property is fully managed locally by Andy and Tres of Freearlifestyle. Following a booking made via Ownersdirect, their contact details are provide by a private email (not via Ownersdirect). The email sent will ask the guests to liaise about their arrival time and transfers, when a taxi from the airport can be arranged (guests paying the taxi driver directly).